On September 28, 2014, at Madison Square Garden in New York, Narendra Modi made a defining statement about himself, his prime ministership and his government. He said: “I am a small man who does big things for small people.” He was not only speaking to the cheering Diaspora in the United States but to the underclass back home that had brought him to power with 282 seats in the Lok Sabha, to his council of ministers, party and bureaucracy. Consider all the things he did in the first three months of coming to power. In June 2014, barely a month after coming to power, in line with the recommendation of the Planning Commission, his government raised passenger fares in suburban trains by 14.2 per cent and freight rates by 6.5 per cent. The increase came before the railway and general budgets. The railways would have earned Rs 8,000 crore by the increase. But unnerved by the outcry, the government rolled back the increase, restricting it to passengers travelling by upper classes who could pay. The message was clear: The government was for reform, even painful reform, but it would do nothing that could be interpreted as hurting the interests of the poor. This was to become the dominant theme of Modi’s political and economic discourse: That the government would not be irresponsible or profligate with public money, but would intervene in the interest of the poor, where possible. The steps for financial inclusion that followed, launch of the Jan Dhan Yojana, targeted cooking gas subsidy, and the first real attempt to set up a social security net in India, sent the same signal. Every policy change made by the government was designed to reward aspiration and upward mobility. In his Independence Day address, his first as prime minister, Modi called himself “pradhan sevak”. This strategy was reinforced by electoral success. In Haryana, the party formed a government on its own for the first time ever, winning 47 of 90 assembly seats. The tribal state of Jharkhand gave the Bharatiya Janata Party 38 of 81 seats and its ally, the All Jharkhand Students Union, five. This gave the BJP confidence to form a government under a non-tribal leader. In Kashmir, the party was able to report a performance (25 of 87 seats) that propelled it into government, though with an ally. Maharashtra was a disappointment (122 of 288 seats) but for the first time, the cadre were enthused that the BJP had shrugged off a demanding ally like the Shiv Sena. It was entirely fitting that the electoral endorsement of Prime Minister Modi should have come via elections to the state assemblies. For he tried, and almost succeeded in, turning the Centre versus state debate into a BJP versus the Opposition one on the issue of empowerment of states. That the 14th Finance Commission report, filed during his first year as prime minister, appeared to tilt heavily in favour of states, made Modi not some remote, distant figure in Delhi but standing with states, holding their hand and urging them forward. Regional parties like the Biju Janata Dal, which had started out with opposing the rise of the BJP, found themselves in a dilemma and eventually had no option, but to side with the government on the Mines and Minerals (Development and Regulation) Amendment Bill and the Coal Mines (Special Provisions) Bill while voting. Even a bitter critic like Nitish Kumar, chief minister of Bihar, had praise for Modi’s handling of the earthquake in Nepal and Bihar. This was consistent with the view Modi was trying to project of himself, as a man of the people. The ‘suit’ and the subsequent defeat in the Delhi elections were a punctuation mark in this narrative. Modi, and Modi alone, was responsible for the India visit of US President Barack Obama that coincided with Republic Day. The prime minister could not have known that a suit that had his name running right through it and was the gift from a diamond merchant would queer the pitch so badly. The decimation of the BJP in Delhi -- it won only three of the 70 seats -- immediately after the Obama visit mirrored the confusion of the poor. How could a man who had been claiming he lived for the dispossessed show so much self-love? For the Opposition, the suit became a useful political metaphor with which to denounce the government. “Suit” segued into “suit-boot ki sarkar”, a terminology that was last employed for the British in colonial India. In keeping with his philosophical belief that India ought to be a country where every individual regardless of his social or economic background should be able to improve himself and his quality of life, Modi pressed for changes in land acquisition laws. This was seen as a ploy by the government to seize farmers’ land. The changes made by the government in the law were in response to demands of many state governments, including some ruled by the Congress. They said in its current form the law would make it impossible to acquire land and infuse capital in the development of rural infrastructure. But the way the changes were interpreted was that corporate houses, aided by the government, would simply divest farmers of arable land. How much the government’s, and Modi’s reputation had slid was evident from the fact that not only the Opposition but even the National Democratic Alliance partners distanced themselves from the government’s proposals. One year on, the Modi government has politically succeeded in not only antagonising allies but resuscitating a Congress that seemed in its death throes. As earlier electoral successes in states testified to Modi’s popularity, the outcome of the Bihar, West Bengal and Uttar Pradesh assembly elections between 2015 and 2017 will tell us if his charisma is intact. 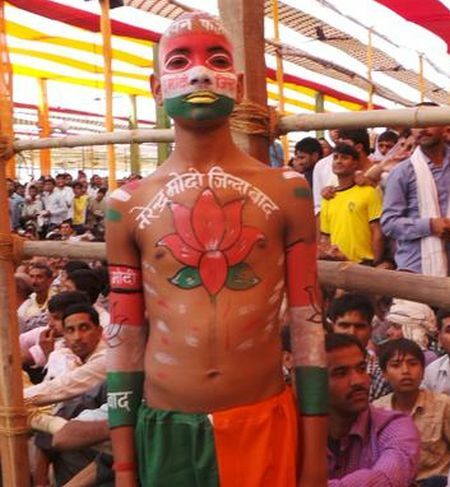 There is still a phalanx of support for Modi. But foreign institutional investors are now beginning to ask themselves if claims that this government will rule for 10 years are entirely well-founded. There are other aspects of Modi’s prime ministership that could become a political threat. At least thrice during the year from various forums -- once during his August 15 speech from the Red Fort, and at least twice in interviews to the media -- Modi has reiterated that it is the Constitution that is the most sacred book for him as prime minister. His replies were invariably in response to questions about attacks on minorities and non-Hindu places of worship. But despite his assertion, such attacks have not ceased. Many see in this a test of Modi’s credibility. Why is this happening? Hindus loyal to the BJP feel a sense of empowerment. They believe a man who has been through the crucible of the Gujarat riots of 2002, where Hindus and Muslims were killed -- though many more Muslims died -- should be understanding, even if he cannot be seen as sympathetic, to the cause of the resurgent Hindu. In their mind, the dialectic of Modi the prime minister and Modi the pracharak is unresolved. No one can resolve this except Modi himself. Will BCCI announce Team India coach by June 6? So hot we need an AC!